This is the second post in a series about defending wing-t offense. This post isn't about defensive scheme. There are many schemes and concepts that can be used to defend any offense, a wing-t offense is no different. This post is focused on the thought process of developing a scouting report for the wing-t and teaching it to players regardless of defensive scheme. 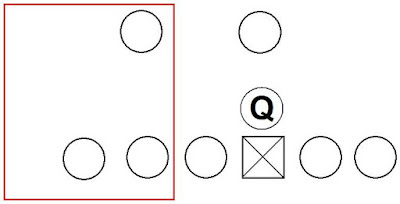 What formations are you likely to see when playing a wing-t offense? That is completely dependent on your opponent. Some wing-t teams use very traditional wing-t formations. These three are very similar and are core formations in traditional wing-t schemes. All three present a balanced formation. 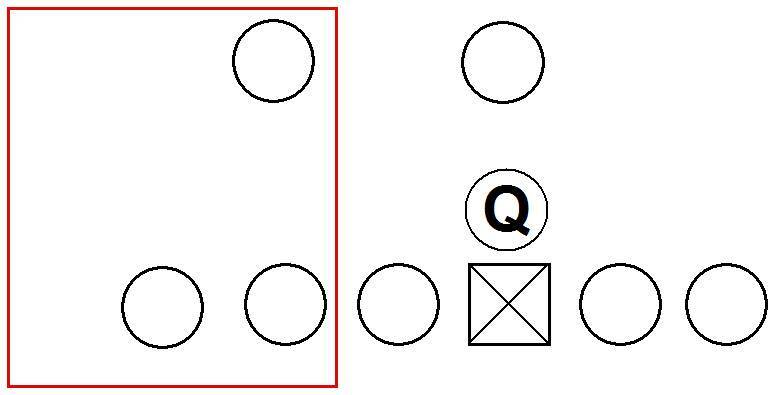 The offense can also choose to overload one side of the formation with the backfield or an unbalanced set. Here the offense has the backfield overloaded to the wing side of the formation. Here the offense has an unbalanced formation with the TE covered up by the SE. Some wing-t schemes choose to spread out. The offense can split a wing out in a receiver alignment to spread the defense. The player at the position may even have a hybrid RB/WR skill set. Other offenses elect to spread out and use shotgun or pistol backfield sets while still running wing-t scheme. Other wing-t schemes decide to condense the formations. Here the offense has created a double wing formation by utilizing a 2nd TE. The end results is a wing-t offense can have many different flavors. There are far too many wing-t formations and variants to break down each one in this article. 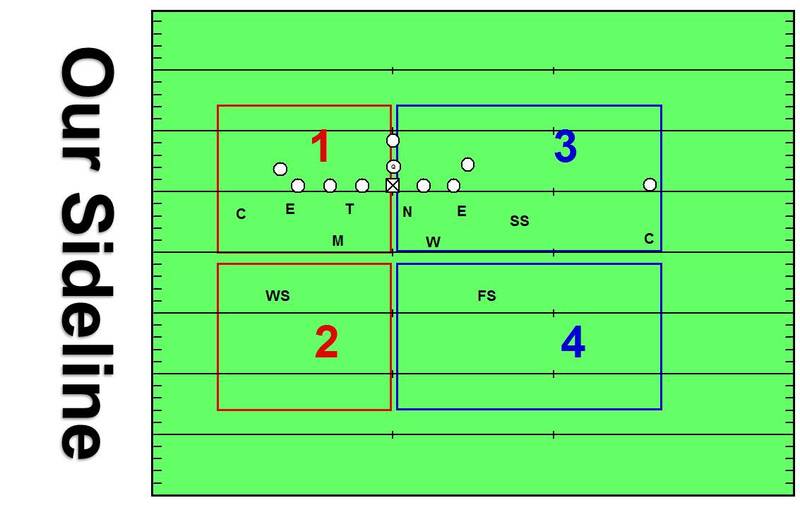 If you have multiple wing-t teams on your schedule you may see a great deal of difference in formations between the two. Formations are not the only consideration when planning for a wing-t offense. The offense will also use motions, trades, and shifts. I'm going to us a very generalized terminology for naming these motions. As there no universal terminology, I don't want to get bogged down in specifically what I or someone else calls these concepts. Here the offense is using a fast motion. This fast motion can be from a split out alignment, wing, or from the backfield. Here the back takes a deep action on the motion. This allows the back to be in position to catch a toss or get into pitch phase on option. Insert motion starts deep initially. The motion back then stops and is able to insert as a blocker. On Rev motion the back again starts deep then reverses course and comes back. Often wing-t teams are using this concept to get defense to over react to an initial deep motion action. Here the offense starts the motion as a fast motion. Once the back crosses the center there is a transition from fast motion to a shoulders square shuffle. This motion is designed to quickly change a balanced formation to an overloaded one or vice versa. The motion player is primarily used as a blocker. This is a very traditional motion seen in almost any offense. The wing is motioning across the formation to be the #2 receiver to the new passing strength of the formation. This list of examples does not cover all wing-t motions but is a general staring point. Again there many motions a wing-t can employ. Wing-t teams also use trades and shifts. Here I am generally defining trade as any pre-snap change of alignment of a TE or a TE wing complex. The offense traded the TE and the Wing from their initial alignment to create an unbalanced formation. Shift generically refers to any pre-snap change of multiple offensive players. Here the offense is shifting both wings to alter the formation. Wing-T teams have a huge number of formations and therefore also have many ways to trade and shift into them. Wing-T teams can also combine trades with shift or shift then motion to present a defense with a long list of looks. With the offense running a large number of formations and combining those formations with motions, trades, and shift there is a lot of information to digest. 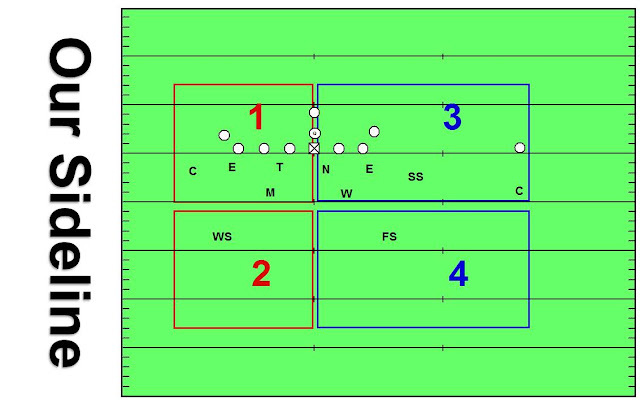 In the previous article on defending wing-t, I showed a simple breakdown diagrams of a wing-t formation. Here are the same examples. And from this information you can see an overview of what the offense runs with no motion and what they run when either wing motions. If the offense is only running a few things it is easy to get a handle on what is happening. As a wing-t team add more formations, motions, trades, and shifts to their arsenal breaking down their scheme and game planning get more difficult. This is especially true later in the season and into the post-season when a wing-t team has their full playbook available. The other challenge is most wing-t teams run some new wrinkle each week. How do we plan for the new unknown element of their scheme? HOW DO WE MAKE SENSE OF ALL THIS BREAKDOWN DATA? The scouting report can easily get confusing for the players. It probable makes sense to you and the other coaches on paper. It may not make sense to the players. There are many formations to identify. There are also multiple motions, trades, and shifts that further confuse the players eyes and identification. After all the old coaching adage, "It's not about what you know, it's about what they know." is true. How do we bottom line the scouting report for them? The answer for me comes from Tubby Raymond, the long time Delaware coach and wing-t innovator. In his book "Delaware Wing-T: An Order of Football", Coach Raymond has a chapter on attacking defenses. One of the concepts he discusses in the chapter is surfaces. He calls them flanks. Coach Raymond says there are four surfaces in the wing-t offense. Coach Raymond also points out repeatedly the wing-t offense is a flow offense. From a defensive perspective there are only 2 flows. Flow toward me and flow away from me. Using the information we can simplify everything for our players. If we look at every formation broken down by surfaces we can layer the tendencies into a composite by surface. As an example here are four formations with a wing surface. Those four can be layered into a composite of what they run to a wing surface. What do they run with flow away from the surface. We are attempting to strip away all the confusion. The offense is going to align in a formation with one of the composite surfaces and we know what they run to that surface. After they trade or shift they will create one of the surfaces we know. The motion represents flow toward or away from you. Once you strip away all the "eye wash" of multiple formations, motions, shifts, and trades wing-t offenses have strong tendencies. The offense may run formations, motions, trades and shifts in our game we have never seen on film but it is unlikely they will have new surfaces. The surface tells us what is going to be run. To quote Denny Green, "THEY ARE WHO WE THOUGHT THEY WERE." We will use a drill every day in pre-practice to get us prepared for a wing-t team. This drill is built off the eye chart concept and is called choir practice. The eye chart is discussed in the previous article. In choir practice we align the formations against the defense. Coaches stand in their quadrant. The players in their quadrant yell out the name of the surface and what they expect to see run to that surface. Coaches are making sure players have the correct identifications. We start simple with formations then add motions, trades, and shifts. As everything is moving the players continue to yell out what they expect to see based on the new surface they are seeing. Choir Practice gets the players and coaches ready for what will happen in the practice and eventually the game. Choir practice ties in with a core philosophy of our defense. "Good defenses react, great defenses anticipate."